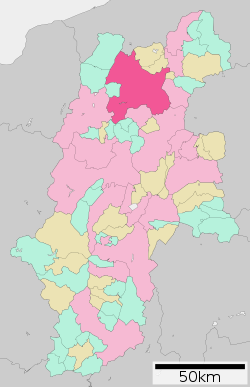 Nagano (長野市, Nagano-shi), the caipital ceety o Nagano Prefectur, is locatit in the northren pairt o the prefectur near the confluence o the Chikuma an the Sai rivers, on the main Japanese island o Honshū. As o Aprile 1, 2011, the ceety haes an estimatit population o 387,146 an a population density o 460 persons per km². The tot aurie is 834.85 km². ↑ "市政情報 > 市の沿革・概要 > 人口・面積・自然". Nagano official website (in Japanese). Nagano City. Retrieved September 18, 2011.